December 11, 2017; Reston, VA — The National Association of Secondary School Principals (NASSP) has appointed MS. MELISSA ARROYO RIVERA to its Student Leadership Advisory Committee to support the association's efforts to build student engagement, service, leadership, and voice for a two-year term. She is the only National Junior Honor Society Adviser from the U.S. & Puerto Rico to be chosen for this appointment. TASIS Dorado 7th-grader NADINE RODRÍGUEZ was selected as one of two middle-level representatives to the committee. Ms. Melissa and Nadine will meet with the committee on January 24-26, 2018 and will also participate in an educational briefing on Capitol Hill on January 25, 2018. 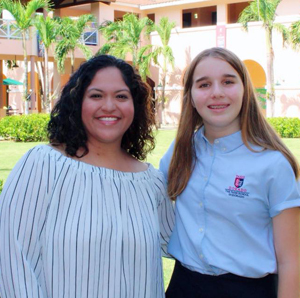 Ms. Melissa is the National Junior Honor Society TASIS Dorado chapter adviser, and she has fostered and supported the development of several service projects. Some of the projects students have developed during her time as an adviser are: collecting food for communities in need, toy drives, beach cleanups, fostering dogs, MDA of Puerto Rico fundraising activities, among others. She also nominated three students to the NJHS Outstanding Achievement Award last semester, and they won. As a member of the Student Leadership Advisory Committee, Melissa will support NASSP's goal of engaging student leaders in influencing federal legislation by creating a platform for student voice. The Committee will also select a theme and implement a nationwide project, in keeping with the precedent set by the previous committee's Global Citizenship initiative. Committee members—eight students (one middle-level student selected by the adviser), three activity advisers, and three principals from across the country--were chosen by the NASSP student programs staff and approved by the NASSP Board of Directors for a two-year term that runs through October 2019. A school committee selected NADINE RODRÍGUEZ LÓPEZ as one of the two middle-level representatives. The Student Leadership Advisory Committee renewal is just the latest installment of NASSP's commitment to student leadership. The association, located just outside Washington, DC, is the home of the National Honor Society, National Junior Honor Society, National Elementary Honor Society, and National Student Council. "NASSP is proud of its longstanding commitment to developing student leaders and amplifying student voices," said NASSP Executive Director JoAnn Bartoletti. "Our nation needs the contributions of every person to help it thrive and progress, so we cannot leave an ounce of human potential undeveloped. With the participation of extraordinary leaders like Melissa, NASSP's efforts will continue to expand so increasing numbers of students across the country can benefit from opportunities to lead, serve, and advocate." The National Association of Secondary School Principals (NASSP) is the leading organization of and voice for principals and other school leaders across the United States. NASSP seeks to transform education through school leadership, recognizing that the fulfillment of each student's potential relies on great leaders in every school committed to the success of each student. Reflecting its long-standing commitment to student leadership development, NASSP administers the National Honor Society, National Junior Honor Society, National Elementary Honor Society, and National Student Council.